In this latest post, I’ll be uncovering some old photos of my early days of joining the Warhammer hobby. I haven’t realised I still had these, or even remembered having these photos taken, so this is going to be a fun trip down memory lane! what your about to see is a an early history of my beginning into the table top hobby, and what they mean to me now when I look back on them. Just a warning though, a lot of these are very bad in quality due to shaky camera quality, and the model painted are not the most pleasing to gaze upon lol. So without further or do, lets dive in! The Island of Blood game board was used for the 8th edition Warhammer Fantasy when the new boxed games was released back in 2010, featuring the High Elves and the Skaven. I got the opportunity to take some photos of the game board when it was available to play at Warhammer World, looking at it close up was amazing to see the depth of detail being done to create it. Sadly, its no longer available to play at Warhammer world (about eight years to be precise!). Whilst playing at Warhammer World with my shoddy painted Skaven (today they’re not as bad now, check the Skaven tag on my blog if your interested in seeing how my army looks now), I took a few photos of a game I had with a friend. These photos remind me a lot about 8th edition and what it meant for me as a wargamer, it was hard to play back then, but I had fond memories of the games and people I’ve met when the world was still turning. Now, Mallus turns in it’s darkened state above the realm of Azyr. This was a collection of photos showing both the Lizardmen vs Dark Elves, played on a grass mat with meh painted scenery. Back then my Dark Elves hadn’t been painted properly as I didn’t have a colour scheme in mind for the army. in fact, it would be eight years later until I’d finally applied a consistent colour scheme in the livery of red and silver. These photos were taken roughly around 7th/ 8th edition days. Finally, one final photo that in my opinion is one the most important one from all shown here today……. This photo isn’t the best one taken (and sadly the only one), its not a picture of the best painted miniature ever, not even me seeing my favourite BL author in person, nor is it me rejoicing at finishing painting 40x Clanrats for my Skaven army. for you see, this photo was important to me as its one of the earliest photos taken showing me gluing my army of Dark Elves at Christmas. This photo is a story of beginning, how at this moment of history captured was a record of my journey into the hobby of table top wargaming. To you, it might not seem much (I wouldn’t blame you as the photo quality is pretty bad), however to me, finding this photo this week after looking through old photos for my dog was a big thing for me. It reminds me of where I’ve started when I started the hobby, and where it’s led me today. I hope this post has inspired you to look back in the past and remember your early days when you first went to your local GW or gaming club. It may remind of the good and bad days when looking back, but those memories remind you of who you are today as a hobbyist. This post is an updated version of my test campaign planning, this time with alterations to the backstory, goals and what system the campaign will based on. During the Age of Myth, a barbarian king of the salt seas of Skorton named Farnjorll, ruled his lands with an iron grip and a ruthless pursuit for riches and power. His tribe, the Dajnir, had built their culture around the cliffs of the salt seas of Skorton in the realm of Beasts, Known to be rich in sea life of colossal creatures of predators and prey. Large enough for the tribe to catch and feed the whole gathering for a month of food. The king one day found a hidden cave on the coast line down south, which had been sealed by a long forgotten tribe centuries ago. He and his people opened the sealed cave to find a cold and unwelcoming Tomb. The king didn’t care for it’s dead inhabitants history, only treasure and power was his desire, so he ventured deep into the dark decaying carcass of the dead. It was Farnjorll who first entered the tombs throne room, which was cast in shadows of the deepest darkness, save for areas of light lit by the tribes torches. The king entered the chambers of the extinct inhabitants throne room, marvelled by the epic scale that dwarfed him. Not long after, he found a crown on a black charcoal corpse that sagged on its crumbled Throne of stone and moss. It’s jaw was wide open, as if it was frozen in mid laughter at its eternal fate. The crown itself was made out of iron in a shape of criss cross horns like a stag, with amethyst covered gems that sparkled in deepest glows of purple. As he wore the crown, he was possessed of madness and raw power of the unknown surged within him. He was gifted with great necromantic power of the necromancer, and the curse of madness that sparks from his possessed sight. He killed all of his people out of lust for their souls like a leech. He set about casting his fell magics to raise the dead with words of another world. The dead had arisen, along with his dead people and the forgotten bones of the dead inhabitants. He at this point was known as the Farnjorll the cursed, for he had set about raiding the lands of the living with madness and crazed monologuing. History will remember this monster for many atrocities including the saking of a civil city of Fendrike and many innocent towns in the lands of Skorton. Eventually though, the king was slain at the battle of the five crows, slain by none other than king Senartati of the Sandheart dynasty with his blade of the sun gods. The king of the desert lands was given a sign by his god (or ordered by Nagash, depending on which sources are true) to go to Skorton and slay the false necromancer. He fought the mad leech king with swift strikes and well timed counter attacks with his ancestors blade. Eventually, Farnjorll died with agony from a piercing blow through the stomach, and slowly turned into withered husk of a corpse. To this day, the crown has been waiting for its next host to control and enslave to it’s necromantic will. Events that will follow will shape the history of Skorton for it’s freedom of the crowns threat, or its sadistic power consumes its new host to destroy the people of Skorton. Now a thunderstorm rages across the lands of Skorton, as the warriors of Sigmar seek to destroy the crown once and for all. They fear that that the long lost legends of the Leech kings return and its prophecy may come true. Lord Celestant Drayven, Lancer of Sigmar, comes to bring the wrath of Sigmar with his Sigmarite blessed lance, and destroy the evil that still lingers within the crypt of Farnjorll’s grace. However, another faction joins from realm of Shyish, the Sandheart dynasty, seeks to reclaim the crown for their patron master, Nefferata, for she wants the crown for her own political agenda against her enemies. Led by the eternal Ak’henaton, he seeks to find the crown by all means necessary to keep his truce with the Blood Queen to endure. First game- First encounter, territory defence. Second game- advancing towards Skortan Crypts. Third game- finding the location of Farnjorll’s crypt within the confines of the Skorton Crypt archives. Sixth game- stop the Leech king and destroy the enemy player. As the Dynasty enters Skorton, they must ensure that they recover the crown for their Queen without failure. For it’s power could progress Neferatas own wicked plans to boost her authority in her political seat of power and influence. Ak’henaton, king of his undead legion, must recover this necromantic treasure by any means possible, and maintain his oath of truce to his Queen, or be turned to ash as well as losing his daughter. However, the Great Necromancer Nagash has demanded that he should have the crown for himself, it’s power could be used to advance his return to dominance in Shyish. Whilst Neferata wouldn’t question her master, she would however, make Ak’henaton pay for betraying her loyalty. The king must make a decision, give the crown to Neferata, Nagash, or maybe, somehow keep both his masters pleased by another way…. Sent by Sigmar to stop the new Leech king, the Stormhost must stop the threat from growing beyond control. As part of their growing alliance, the Lords of the Pisces seek to help the Skortons of their plight in return for their loyalty towards the Grey-mane Dynasty truce. Lord Celestant Drayven, Lancer of Sigmar, has recently been reforged after being defeated during a failed scout attempt to regain the East Bastion of the Grey-mane Dynasty. Having lost more of his humanity, he is slowly becoming a cold and unforgiving automaton of vengeance. His remains humanity is all that he has left to endure, or else become a hollow shell. The Stormhost can’t fail, for not only would the people of Skorton be doomed by both the Undead legions of Nagash, but also from the Leech Kings reawakening. Failure will result in shame which will hang heavily on every Lords of the Pieces, just like their past lives when they lost their homeland from Chaos. But if they can succeed, the Stormhost may just be able to turn the tide, and rebuild a new city in Skorton. Thank you for reading this post. If you have any suggestions or questions, post a comment below and I’ll reply back as soon as I can. Thanks! Hello, and welcome to a first (and hopefully more to come) post on a planned campaign game set in the realms of AoS (pre Malign Portents) . I wanted to try and construct my own narrative campaign for the first time, using inspiration and help from the GHB 2018. This time I wanted to improve on the last campaign flaws by making a test campaign planning, that can be improved and edited for the final version outcome. During the Age of Myth, a barbarian king of the salt seas of Skorton named Farnjorll, ruled his lands with an iron grip and a ruthless pursuit for riches and power. His tribe, the Dajnir, had built their culture around the cliffs of the salt seas of Skorton in the realm of Beasts, Known to be rich in sea life of colossal creatures of predators and prey. Large enough for the tribe to catch and feed the whole gathering for a month. The king one day found a hidden cave on the coast line down south, which appeared to have been sealed by a long forgotten tribe centuries ago. He and his people opened the sealed cave to find a cold and unwelcoming Tomb. The king didn’t care for it’s dead inhabitants history, only treasure and power was his desire, so he ventured deep into the dark decaying carcass of the dead. It was Farnjorll who first entered the tombs throne room, which was cast in shadows of the deepest darkness, save for areas of light lit by the tribes torches. The king entered the chambers of the extinct inhabitants throne room, marvelled by the epic scale that dwarfed him. Not long after, he found a crown on a black charcoal corpse that sagged on its crumbled Throne of stone and moss. It’s jaw was wide open, as if it was frozen in mid laughter at it’s eternal fate. The crown itself was made out of iron in a shape of criss cross horns like a stag, with amethyst covered gems that sparkled in deepest glows of purple. As he wore the crown, he was possessed with madness and raw power of the unknown, that surged within him. He was gifted with great necromantic power of the necromancer, and the curse of madness that sparks from his possessed sight. He killed all of his people out of lust for their souls like a leech. He set about casting his fell magics to raise the dead with words of another world. The dead had arisen, along with his dead people and the forgotten bones of the dead inhabitants. He, at this point was known as the Farnjorll the bloody (or cursed), for he had set about raiding the lands of the living with madness and crazed monologuing. History will remember this monster for many atrocities including the saking of a civil city of Fendrike, and many innocent towns in the lands of Skorton. Eventually though, the king was slain at the ‘Battle of the Five Crows’, slain by none other than king Senartati of the Sandheart dynasty with his blade blessed by the sun god. The king of the sun lands had swore an oath to save the people of Skorton in return for its loyalty to his dynasty. He fought the mad leech king with swift strikes and well timed counter attacks with his ancestors blade. Eventually, Farnjorll died with agony from a piercing blow through the stomach, and slowly turned into withered husk of a corpse. Now a thunderstorm rages across the lands of Skorton, as the warriors of Sigmar seek to destroy the crown once and for all. They fear that that the long lost legends of the Leech kings return and its prophecy may come true. Lord Celestant Drayven, Lancer of Sigmar, seeks to bring the wrath of Sigmar with his lighting lance, and destroy the evil that still lingers within the crypt of Farnjorll’s grace. However, another faction of the realm of Shyish, the Sandheart dynasty, seeks to reclaim the crown for their patron master, Nefferata, for she wants the crown for her own political agenda against her enemies. Led by the eternal Ak’henaton, he seeks to find the crown by all means necessary to keep his truce with the Blood Queen to endure. The oath of the past still clings onto the now eternally decaying Tomb Kings of the Sandheart Dynasty, for they have promised the people of Skorton to help them in their direst need in return for loyalty to the dynasty. Their current king, Ak’henaton, is sent by Nefferata to retrieve the crown of legend to her as part of their long standing deal of alliance. However, the king must choose between his loyalty to the Skorton lands (for Nefferata will use the crown to doom the lands if she had her way), or betray his ancestors oath to enrage them, and keep his alliance to the Mortarch of Blood in good standing. Sent by Sigmar to stop the new Leech king, the Stormhost must stop the threat from growing beyond control. As part of their growing alliance, the Lords of the Pisces seek to help the Skortons of their plight in return for their loyalty towards the Grey-mane Dynasty truce. Unaware of their ancient truce, the Stormhost have crossed paths with the Tomb Kings, who now seek to reclaim the crown for purposes of likely ill intent. Lord Celestant Drayven, lancer of Sigmar, must not only destroy the cursed crown, but also to decimate the foul necromantic soldiers of the Blood Queen. Thank you for reading my test campaign planning. I would be grateful for any feed back and suggestions, wether your experienced at planning campaigns, or from a gamers prospective. Thank you for reading this post. If you have any questions, post a comment below and I’ll reply back as soon as I can. Thanks! [Note: Originally I was going to post this battle report a few days after a game of AoS, Khorne Bloodbound vs Death alligence. However, I ended up scrapping the post, as I wasn’t sure it was interesting or even worth posting. I quickly jumped to the end of the report, having felt I wasn’t doing a good job at writing the report. Last week, I’ve played a game of AoS against my friend, a 1000pt game using my Khorne alliance against Death allegiance. The battleplan objective was to capture the opponents objective from their respective zones, as well as defending our own objective. For my tactical plan against my opponent, I did some research on my opponents army from previous games, as well as seeing the army’s warscroll effectiveness. Overall, I’ve written a two page essay style research on my opponents army, and what tactical choices I can make using the models I’ve got. Now, I’m renown for losing most tabletop games, as well as having bad luck with dice rolling at around turn 2 and 3, so I needed to really focus on defeating the Death allegiance with what I’ve gathered from my research. Back in February, I played my first game of Khorne Bloodbound against the Death alligence, which I had some success for a few rounds. Whilst I nearly won the game, the Death army screwed my Khorne alliance pretty badly. This is in part due to my casual play style of not taking the game too seriously (I mean sending a unit of 20x Bloodreavers against the Necropolis Knights is a great idea, right?). Also, have you guys ever played against a unit of Necropolis Knights? Their damn op as a unit! (it almost makes the Tomb king players badass for fielding a whole army of these abominations!). Therefore, I needed to take my opponent out by using the units weakens to my advantage. My plan was set when I placed my units in my deployment zone. The image above is my movement plan that I did on my first turn, moving my units up to either charge or flank any enemy’s that try to slip through the gaps. Whilst this plan was going smooth at first, it soon became apparent that things got chaotic from the constant annoyance of the Necropolis Knights (curse that icon bearer!). What nailed the break line was the Tomb king slaying 9/10 of my Bloodletters of Khorne in one turn! However, my Flesh Hounds were resilient enough to deny the Ghoul king his magic and defeated him in combat. Sadly my Warlord was killed by the Necropolis Knights, even his reality axe didn’t have any worth against this abomination unit. Skipping to the end, a few units were left standing on my side but couldn’t stop the outcome of the Tomb king taking hold of my defended zone. Ultimately, I’ve lost the battle. So what did I learn from this battle? Necropolis Knights are becoming a tedious thorn at my side, it’s a unit that can withstand anything as long as the Icon bearer is alive. My only option is to find a way to dish out multiple wounds on the unit using my Blood Warriors and Khorgorath. The skullcannon was okay, it did some damage on a lucky roll, although it’s 1 attack for range attacks is a hit and miss. Skullreapers were actually useless, they defended the objective till the end, but were slaughtered easily by the Tomb King. Flesh Hounds were one of the top units I’d recommend for this battle report. Not only did they nullifie the Abhorrent Ghoul Kings Magic, but they also slain him in combat! Bloodletters of Khorne didn’t even stand a chance………. Bloodsecrator did a fine job of buffing my units, although I think he could have been more useful if my Blood Warriors had joined him. Blood warriors didn’t get a chance to cause any attacks, it all ended too soon for them to deal any damage to the foe. Hello, and welcome back to ‘On the hobby able’. 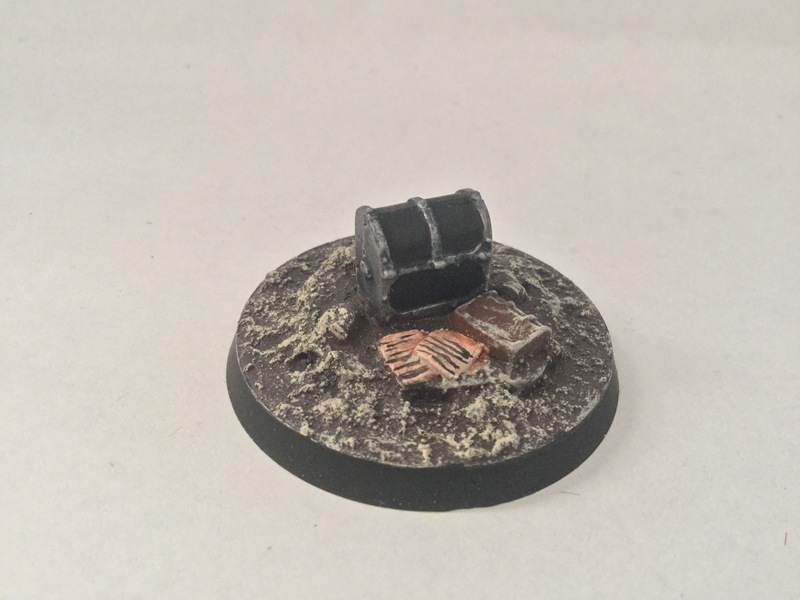 Today, I’ll be showing you three markers I’ve made for my AoS Skirmish campaigns, ranging from a priceless treasure chest, to a decaying Crypt Horror that’s been buried (or clawing out) in the damp soil. These markers can also be used for different battle plans that require objective markers, or objects to defend. So when it came to creating my own markers, I didn’t need to wait long to find some bitz that would look great as markers. Below are three markers I’m currently working on, I hope you’ll find these markers to be inspiring and odd! 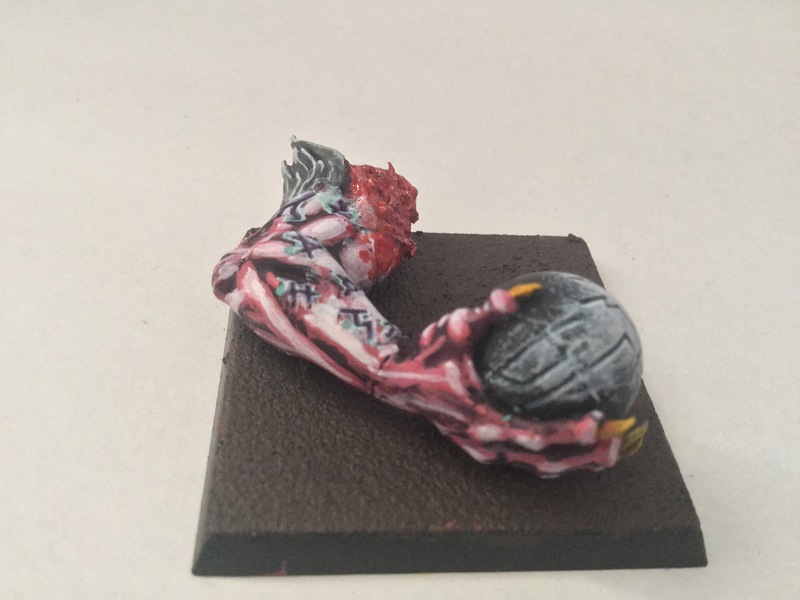 A severed hand from a Verminlord Warpseer, still clenching his glowing artefact of corruption. This marker would be a good choice for Chaos alliance players, especially Skaven players seeking to reclaim or retrieve a rival clan artefact. The remains of a Crypt Horror can be both a well earned reward, and a bad omen. For their bones can be used by the Flesh-Eater Courts to create bone weapons and magical trinkets for both champions and their delusional leaders. 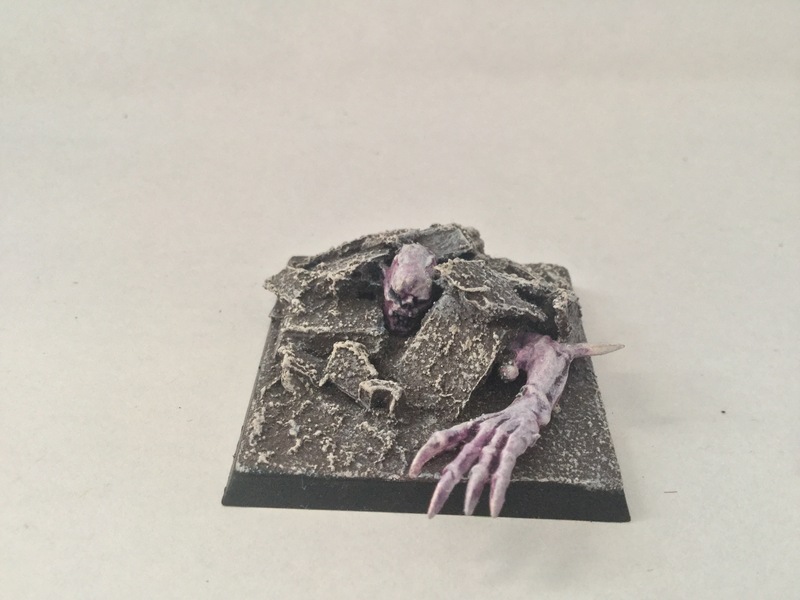 This objective is easily built using spare parts from the Crypt Horror kit, as well as using a spare square base (which is great for objective markers, as I have too many square bases that I don’t use anymore). Last but not least, the goal of all plundering raiders and treasure seekers, the good old treasure chest! This chest was taken from Games Workshops Lord of the Rings starter set (no longer produced), which came with other small objective markers for the game (whatch this Space for more objective markers from the set soon!). It was a simple step of glueing the chest onto a circle base, which looks pretty cool after painting the marker. That’s all for now, I’ll be back with more objective markers soon, as well as some new markers for buffs and effects to represent warscroll effects. Until then, I hope you have enjoyed this post, and I’ll see you guys next time! A few days ago whilst I was looking through some hobby blog sites, I’ve found something that I had to spread the word on. A website called Mengel Miniatures has an article about an unofficial and fan made Tomb Kings battletome! Tyler M and contributors have created a jaw dropping battletome, that many Tomb King players would be inspired to read and play. What’s even better is the fact that the battletome is on PDF, so it can be read anywhere on the go. I have a friend who has a Tomb Kings army that he’s been using for a few AoS games now, creating an amazing backstory and colour scheme to represent his army. Sadly it’s a shame that the faction is no longer being supported in AoS, only carried on in the compendium download. Thank you for reading this post. If you can, check out Mengel Miniatures and spread the word about the site. Fan made projects like this deserve praise for the hard work and effort being put into the project. Todays post is a test battle report post in a game of AoS, which pits the rage-full zealots of Khorne Bloodbound against the undead legion. The game involved a lot of carnage from my Khorne Bloodbound, trying to complete their ritual in time to appease their God, Khorne. They have captured a feeble Ghoul Queen from an undead faction, who seek to take her back from the zealots of Khorne. We used the battlescroll ‘condemned’ from the Generals Handbook, which fitted perfectly with our factions that we’ve used for the game. Below is a list of what we’ve used for this battle, capping at 1,000pt. For at least three rounds, I was able to get the first turn in each battle round, and successfully score a wound roll for the captive ritual. However, my army was quickly diminishing from the enemy faction, mainly from the Necropolis Knights who dealt some serious attacks on my BloodReavers and Blood warriors. Vice versa, I’ve done some major attacks on the undead, taking out units of Crypt Ghouls as well as taking down one Necropolis Knight twice (it came back on the field due to its units ability). But overall, during the fourth turn, my priest was defeated, units wiped out and my Mighty Lord of Khorne was bested by a Tomb King (sadly, didn’t even get a six to slay the king with my lords reality tear axe in his final moments!). One of the most significant achievements I’ve done in a long time was successfully rolling dice, unbelievably getting the first turn every battle round was a big advantage for getting closer to my objective goal. Also, I was able to wound the captive model in a clear streak of successful rolls. Combinations with unit abilities was also a hi-light for me, as my Bloodreavers got pretty lucky with their bonus attacks from my Bloodsecrator being keyworded of ‘totem’ and ‘chaos’, totalling in 2 attack. Not only that, the Bloodsecrator using his totems ability each hero phase can boost all units within 18′ with an extra attack characteristics and ignoring battkeshock test. That’s a total of 3 attacks for each Bloodreaver (4 for champion) that ignors battleshock tests, pretty sweet indeed! The Blood warriors also had some success during their battle against the Necropolis Knights, with their back up ability to deal combat when they’ve been wounded and slain by combat phase. This would be very useful against heavy wound units such as Verminlord Corruptors, Screeming Bell and Hellpit Abomination. 1. Full strength units could have made a small difference for the game, giving me more time to complete the ritual. I had two units under strength that had been beaten up by turn 2-3. I’ll elaborate on my disagreements with pitch battle points for understrength units in another post soon. 2. My original plan was to reserve my Mighty lord of Khorne from battle as a back up for the ritual if ever should my Slaughterpriest be bested. However, my lords combat abilities could have been useful if he’d stayed with the Blood Warriors. This would be helpful against the Necropolis Knights, as my Blood warriors could deal some damage to the Knights, as well as their Lord deal the final blow. 3. My army was below its 1,000pt limit by 100pt, which I could have used to boost units or add units with that much points. However I haven’t got any more models to fill that space up, so I might invest in boosting my Blood Reavers to a unit 35x, a hero model to boost units by its ability or adding a unit of Khorne Deamons to the army. There’s a variety of options to create new lists, so I can pick and mix units and characters to suit the battleplans objective goal. 4. Since this was my first game using Khorne Bloodbound, I had a bit of luck using them in battle, however I think I need to understand my army a lot more in play style to fully grasp its pros and cons for AoS games. I hope you guys have enjoyed this post-battle report post, I’ve very much enjoyed playing the Khorne Bloodbound faction for the first time. I want to do more battle reports with photos in the future, to show how the battle developed throughout the battle rounds. If you have any questions, post a comment below and I’ll reply back as soon as I can. Thanks!